With International Women's Day on Monday March 8th, the workshop on equalities at the SERTUC Conference was particularly timely. Teresa Mackay from UNITE reported back on a range of issues from bullying and harrassment, inequality in pensions provision, homophobia and the danger posed by the BNP. 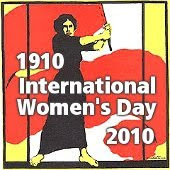 Many women workers will be taking part in the civil service strike on March 8th and 9th. Try to visit the PCS picket lines at your local Job Centre and, if you are not working, support the London demonstration on Tuesday. It starts by the Imperial War Museum from 11.30am and finishes with a rally at Westminster Cathedral Hall from 1.00pm. UPDATE: The latest TUC report, Women and the Recession – One Year On, warns that early public spending cuts would hit female employment hardest because around four in ten women work in public sector occupations, compared to less than two in ten men. It points out that cuts to public sector pensions would also increase the gender divide in retirement income and lead to greater poverty for female pensioners.